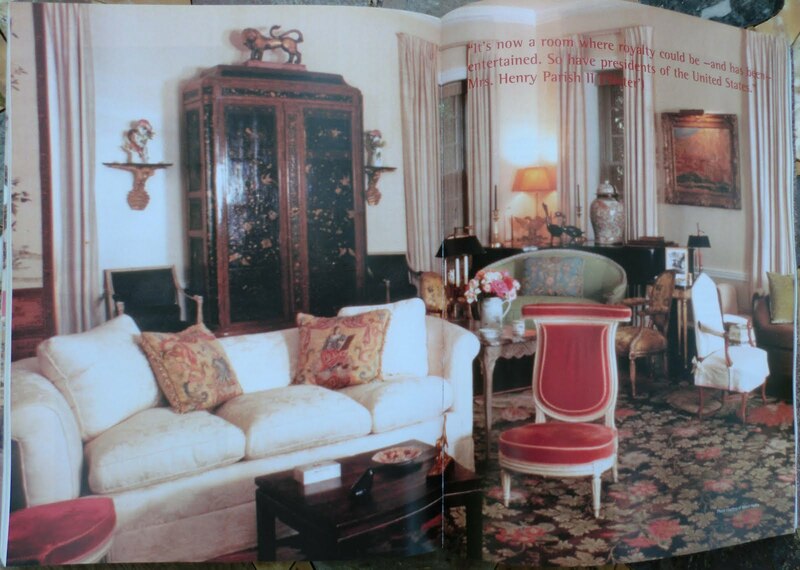 As promised in the previous post of The Devoted Classicist, this will show some of the furnishings from the notable house, Cragwood, as it appeared when it was the residence of Mrs. Charles (Jane) Engelhard, Jr., The interiors were decorated by Parish-Hadley, my former employer, and only a few limited photos were ever published, to my knowledge. Many wonderful projects from Parish-Hadley will, unfortunately, never be seen by the general public because of privacy issues. (This is also an issue with my own John Tackett Design projects). 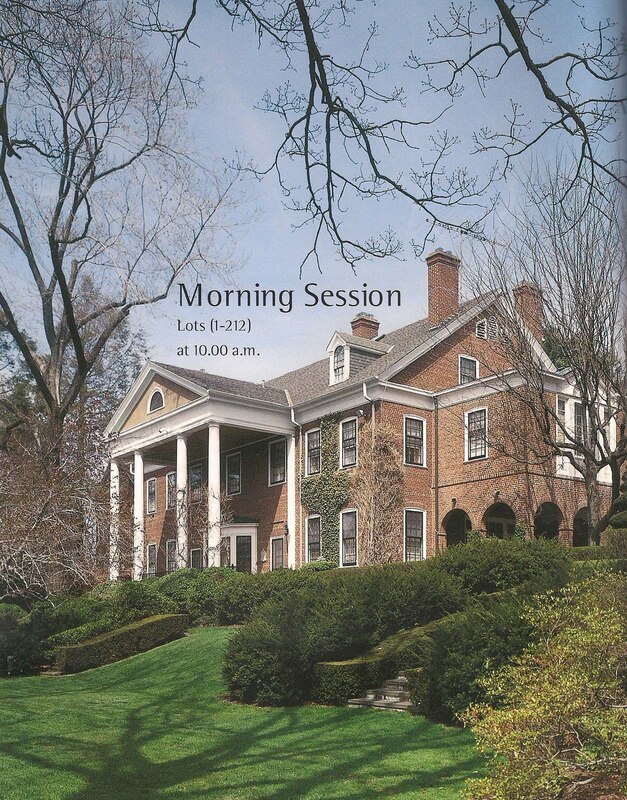 The source of all these images and their descriptions are from the auction catalogue, code CRAGWOOD-1596, that took place a year after Jane Engelhard's death, but 15 years after she had sold the house. 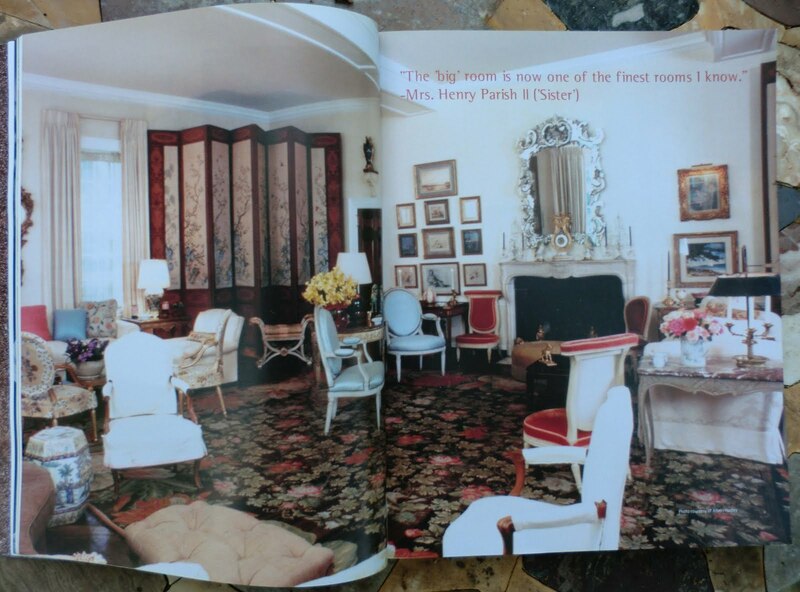 Although the views of the interior are not of great quality, they do show an accurate record of how the house actually looked, and not propped or rearranged just for a photo shoot. Dollar amounts are not usually a feature of this blog, but since these are in the public domain, the realized auction prices, including the buyer's premium, are included for educational purposes. 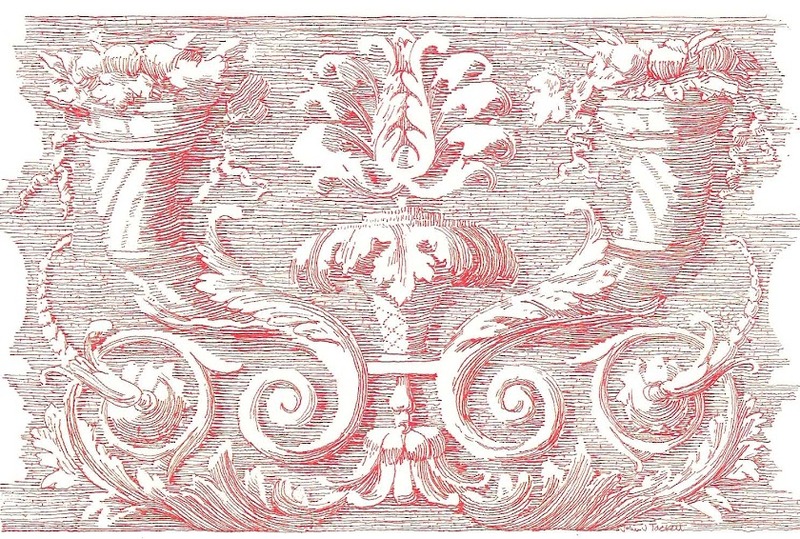 Many standard, traditional decorative arts terms are illustrated, so it is hoped this will be a useful reference as well. Sister Parish contended that a proper Living Room had at least three seating groups, and the Big Room, as it was called at Cragwood, illustrates that point. Decorating styles can sometime be hard to catagorize; while this room's contents were all carefully considered, I hestitate but call it an Undecorated Style. More edited and curated than the Eclectic Style popular today, there is no mistaking that the resulting intent was to show a home whose owners were secure in a position of wealth and good taste. 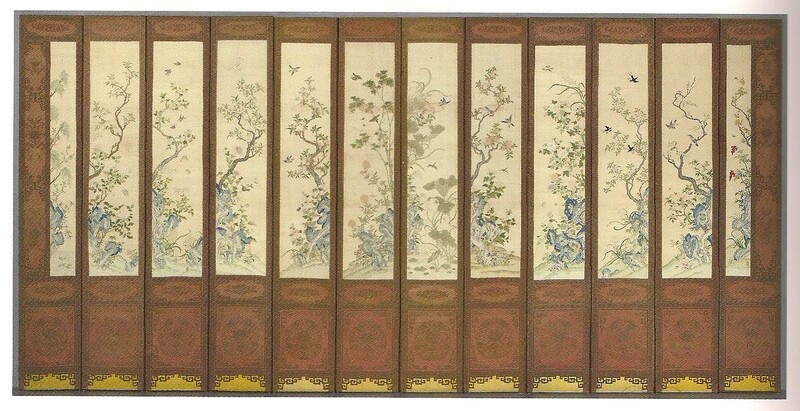 One end of the room is anchored by a very rare Kesi trompe l'oeil twelve-panel screen from the Qianlong period (1736-1795). $408,000. 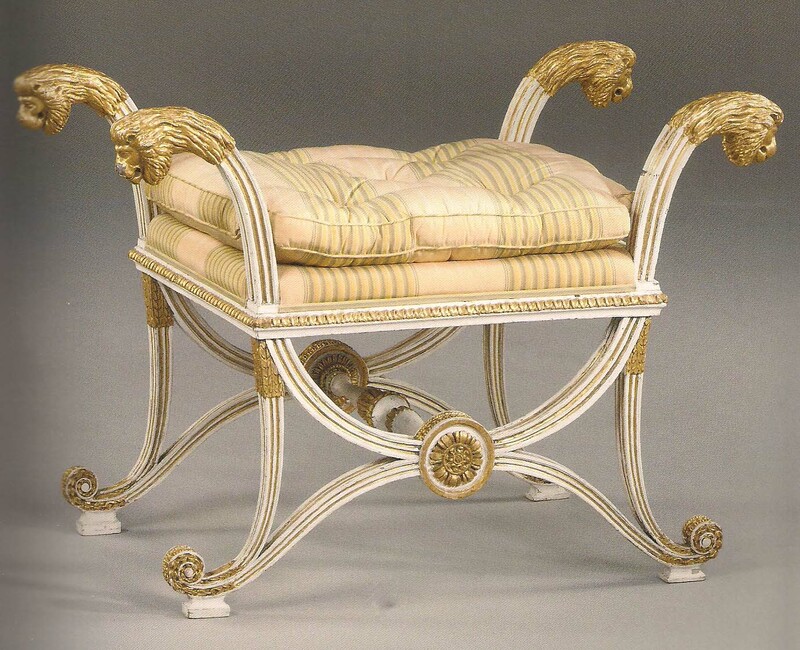 An Austro-Hungarian stool,, with white painted and parcel gilt decoration was almost certainly part of a salon suite made for the Erdody Palace, Budapest, and may have originally had a fan-shaped padded back. Circa 1800. $21,600. 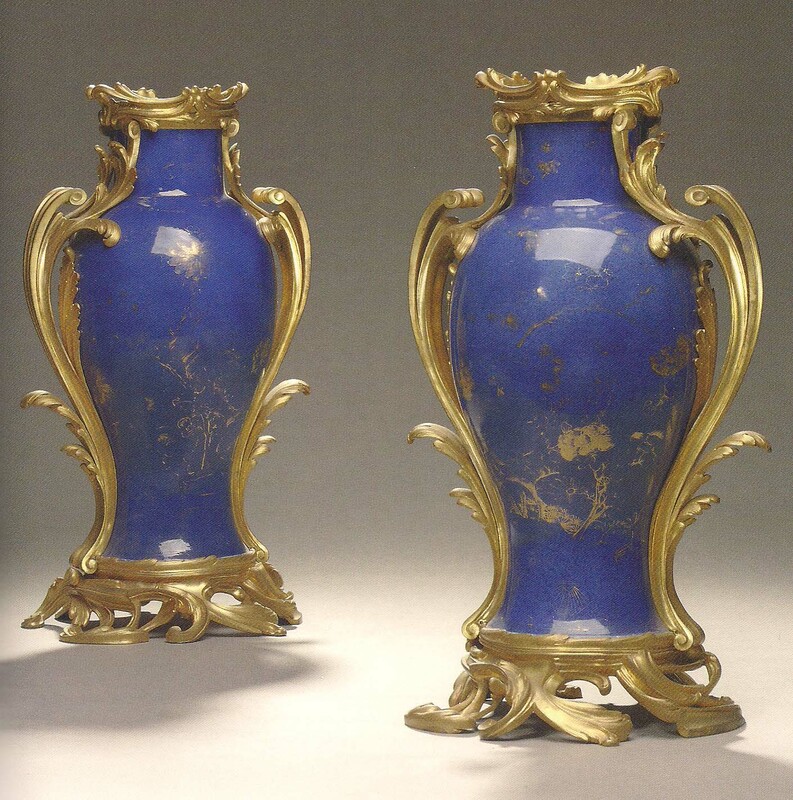 A pair of French ormolu-mounted Chinese powder-blue porcelain baluster vases were installed as overdoor decoration. 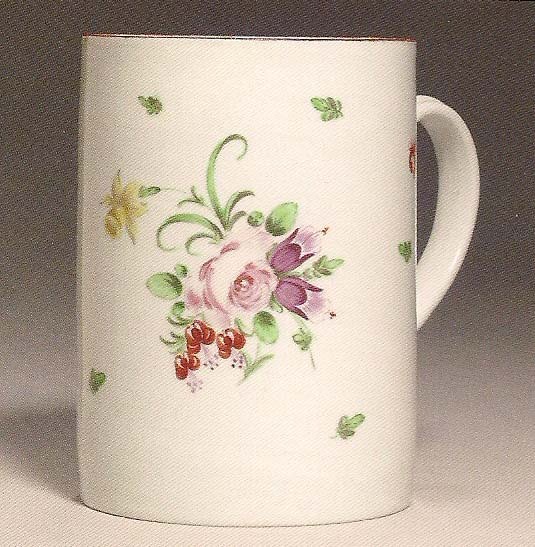 The Kangxi (1662-1722) porcelain was cut down to accommodate the mounts, probably 19th century. $12,000. 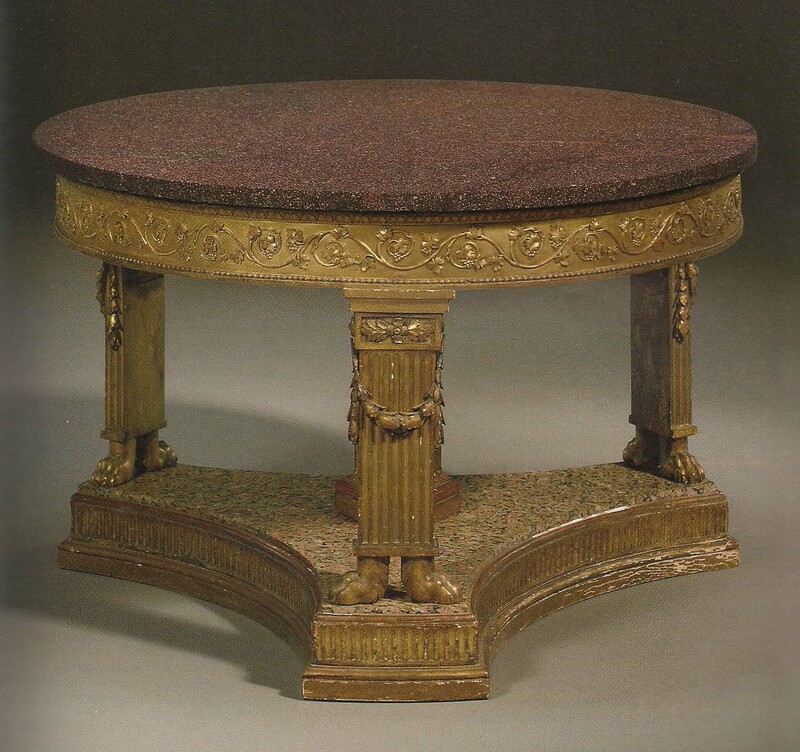 An Italian Empire giltwood center table with porphyry top, circa 1803-06, was almost certainly ordered by Cardinal Joseph Fesch, uncle of Napoleon I, for his residence in Rome, Palais del Buffalo-Ferraioli. The 45 inch diameter top is particularly impressive. $168,000. 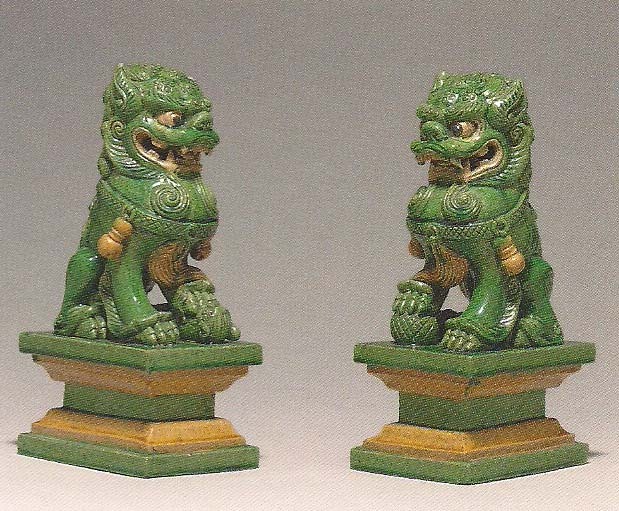 A pair of Buddhistic lions, a male and a female, glazed in green, amber, and cream are from the Qing Dynasty (1644-1911). $2,280. 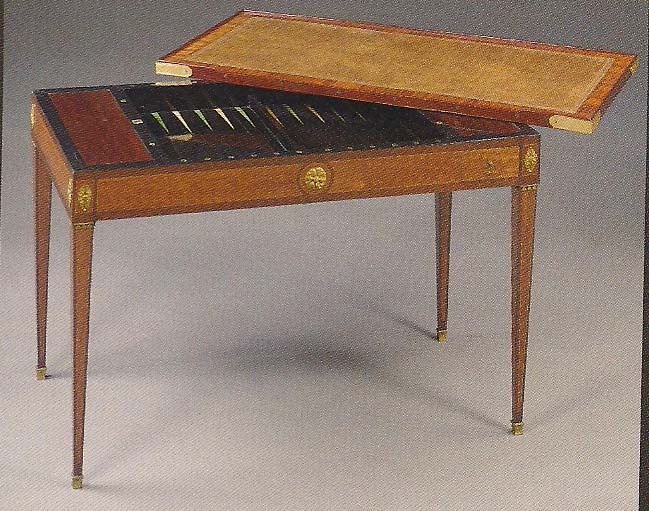 A Louis XVI ormolu-mounted tulipwood, amaranth and mahogany tric-trac table is stamped "J. POTARANGE JME", late 18th century. Tric-trac is a game that uses the same equipment as backgammon; the top lifts off to reveal the playing surface. $14,400. 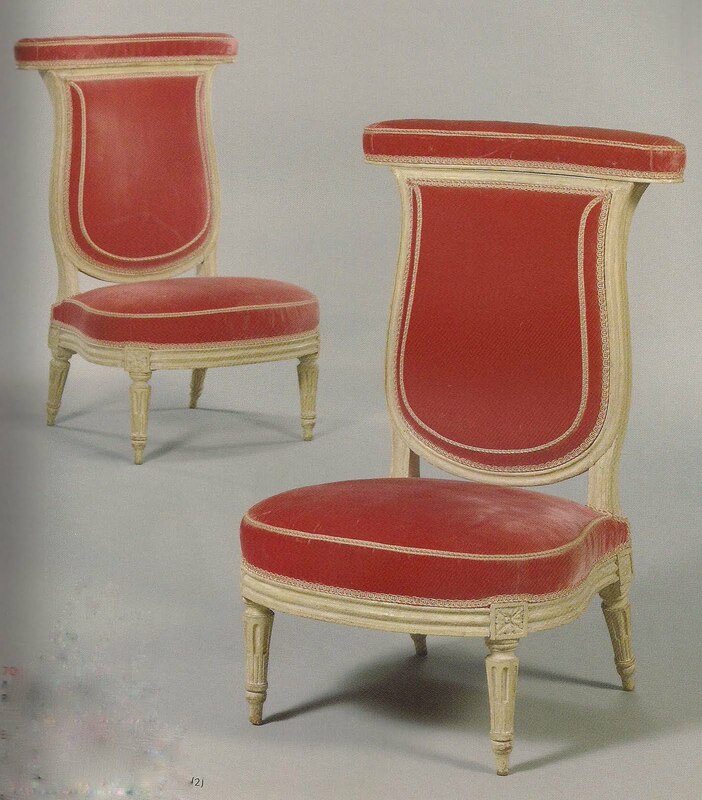 A pair of Louis XVI voyeuses, from the late 18th century, were originally intended to be sat on backwards. (This form should not be confused with a prie dieu). $18,000. 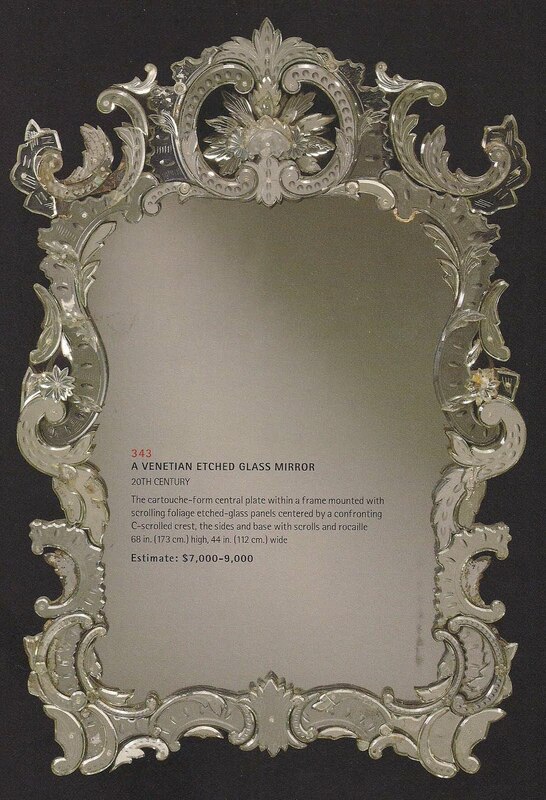 The Venetian etched glass mirror, 20th century, hung over the fireplace. $46,000. A Louis XVI ormolu and white marble lyre mantel clock has the signature "Bourdier a Paris" on the dial. Circa 1790. $31,200. 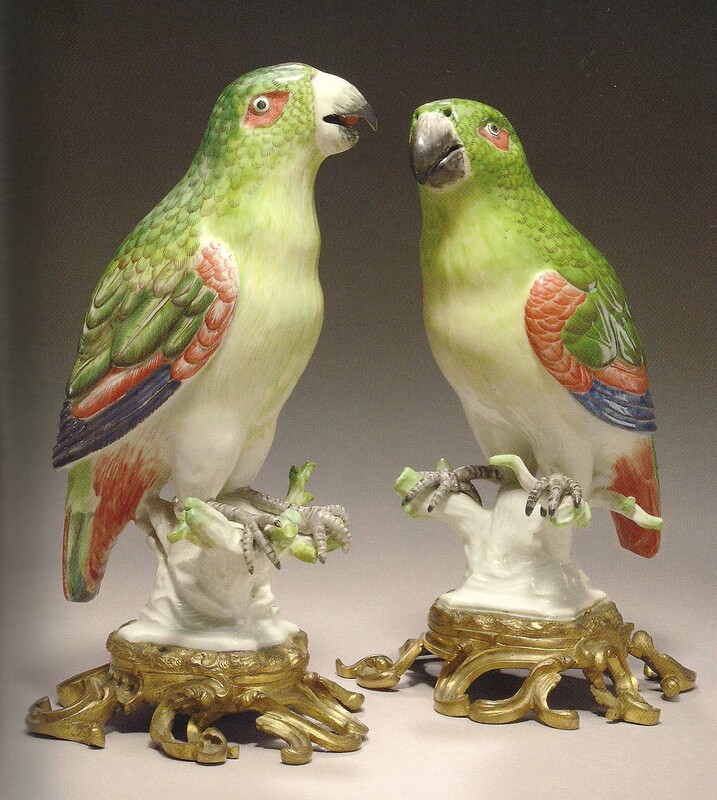 A pair of porcelain Hochst models of parrots, circa 1752, on later German ormolu bases in the Louis XV style were thought to be from a Sotheby's London auction in 1965. $156,000. 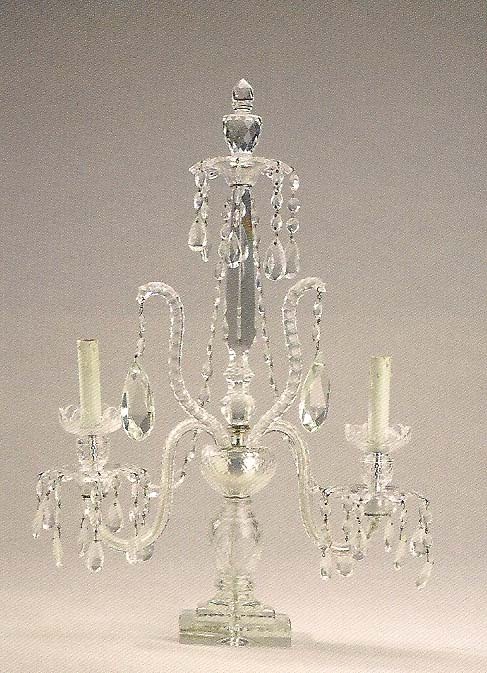 A pair of Anglo-Irish cut-glass two-light candelabra, late 19th century, were placed on the mantel with black candles, another Sister Parish trademark. $1,200. 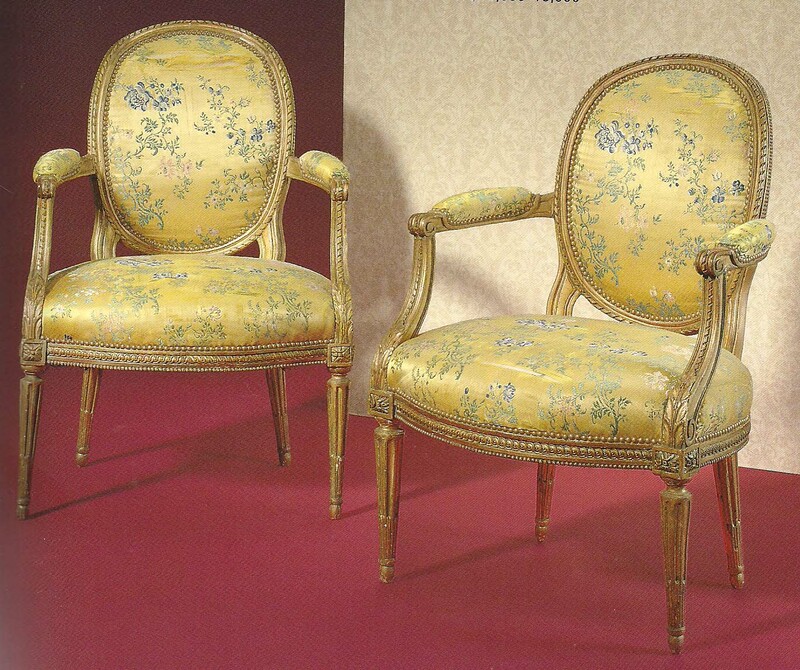 A pair of late Louis XV ormolu chenets are stamped "FF" and "FEUCHETE". Circa 1765-1770. $33,600. 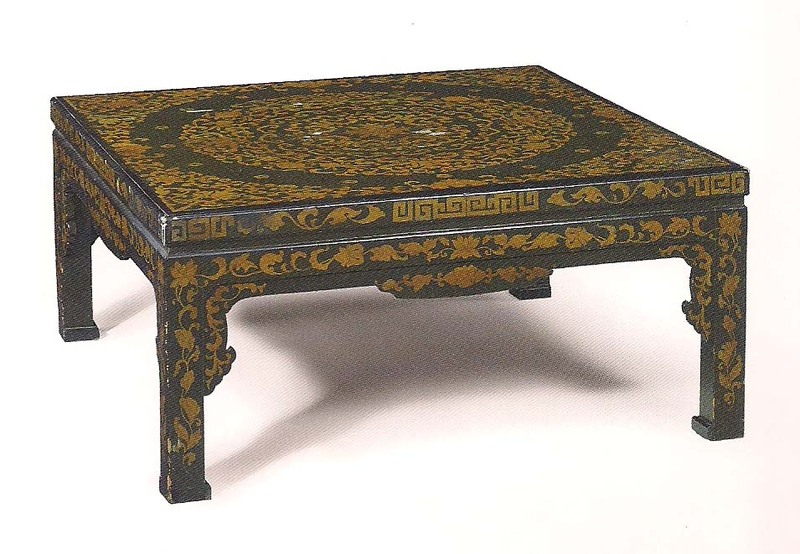 A Chinese style gilt and black lacquer low table, 20th century. $4,200. A Bristol tankard, circa 1770, is 5 5/8" high. $2,280. ﻿A wonderful lacquer cabinet visually balances the Kesi screen at the other end of the room. 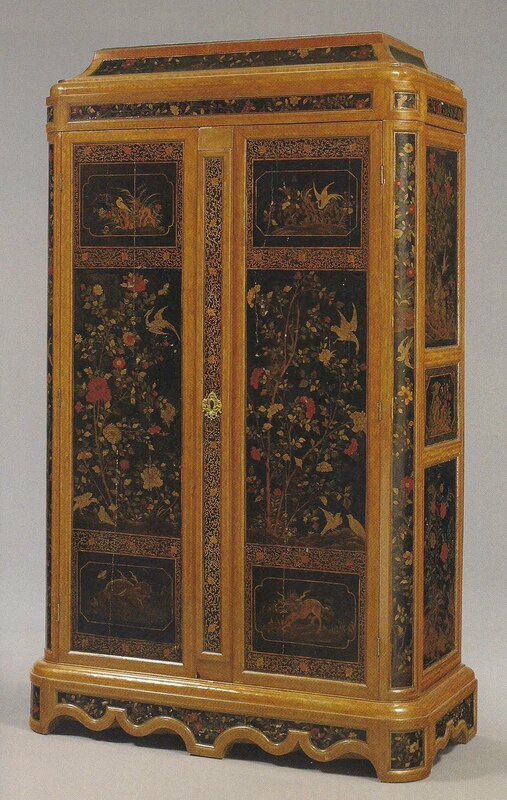 A Regence bois satine and Chinese and European lacquer armoire, signed and dated Louis Guidnard, 1723. The Chinese lacquer panels are 18th century, probably cut from a screen. $180,000. 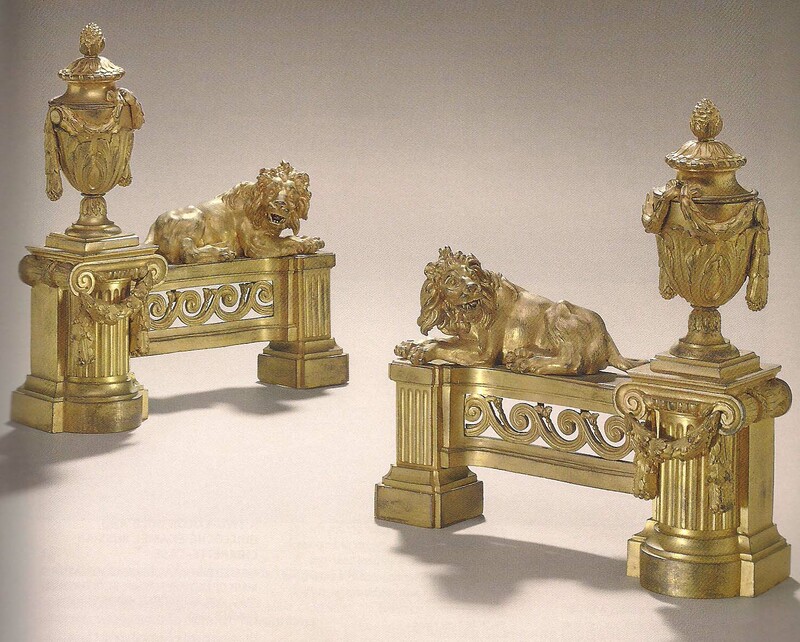 A pair of English giltwood and faux marble brackets are from Stair & Company, New York, probably 20th century. $3,340. 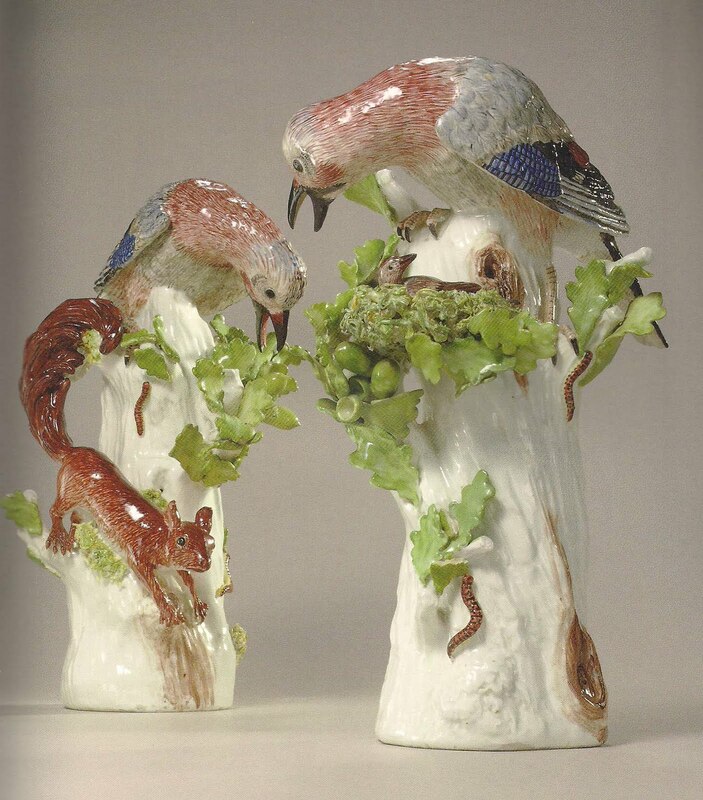 A pair of Meissen models of Jays (Eichelhaher), circa 1740, were modelled by J.J. Kandler. $22,800. 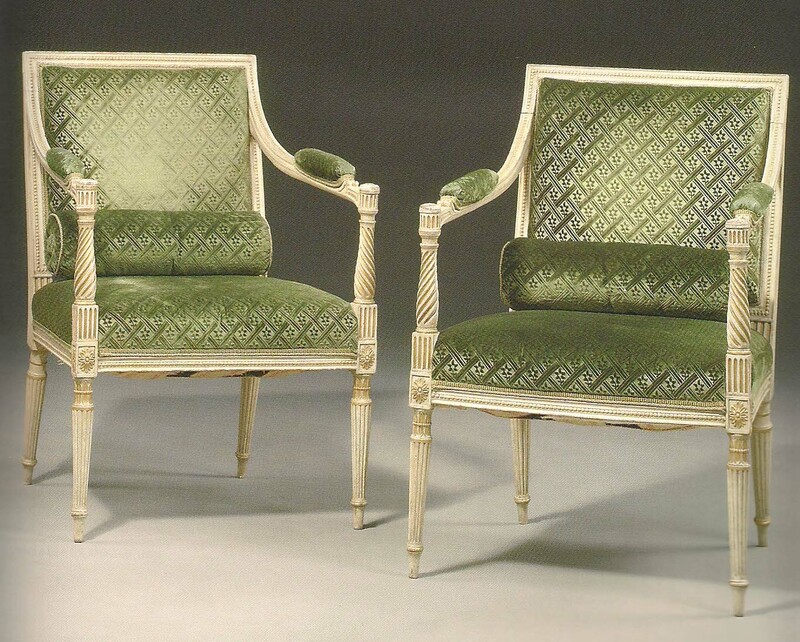 A pair of George III white-painted and parcel-gilt armchairs, circa 1780, bear a Norman Adams, London, label. $45,600. 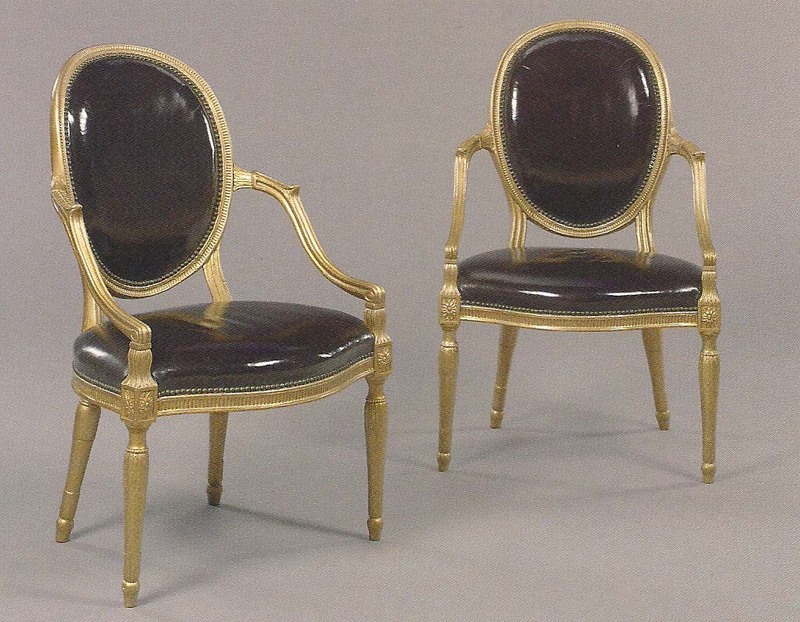 A near set of six Louis XVI giltwood fauteuils from the late 18th century had been regilded. 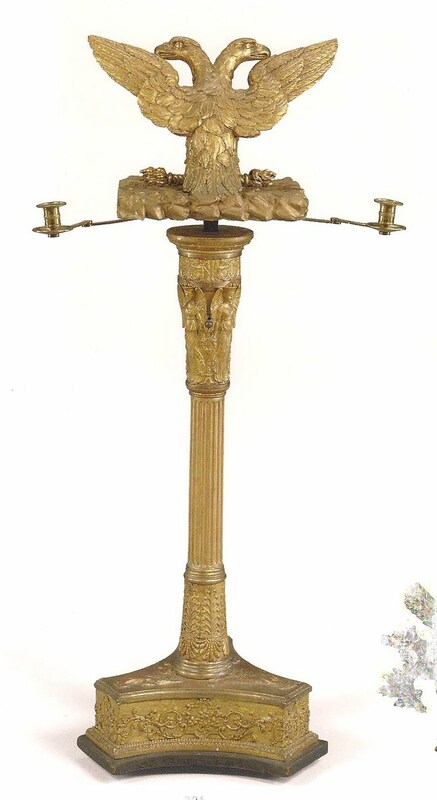 The giltwood and gilt composition lectern from Central Europe is 49 inches tall and dates from the first half of the 19th century with the rockwork platform later. I could be mistaken, but I am thinking that this is a slightly earlier view of the Big Room. There are only a few adjustments and relocations. 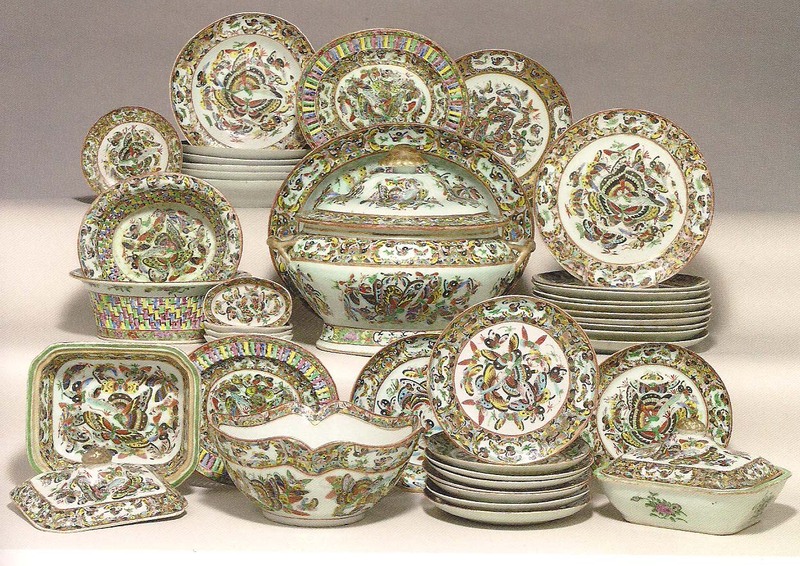 A Chinese export porcelain "Canton Famille Rose" part dinner service, 19th century, is decorated in the "Thousand Butterfly" pattern. $22,800. 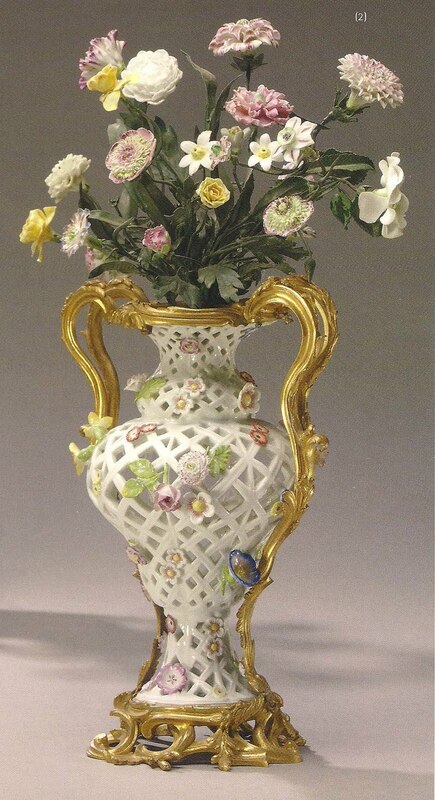 A pair of ormolu-mounted Meissen porcelain potpourri pierced baluster-form vases, circa 1750, have German and French flower decorations, 18th/19th century. The associated tole inserts and the mounts are probably 18th century. $36,000. 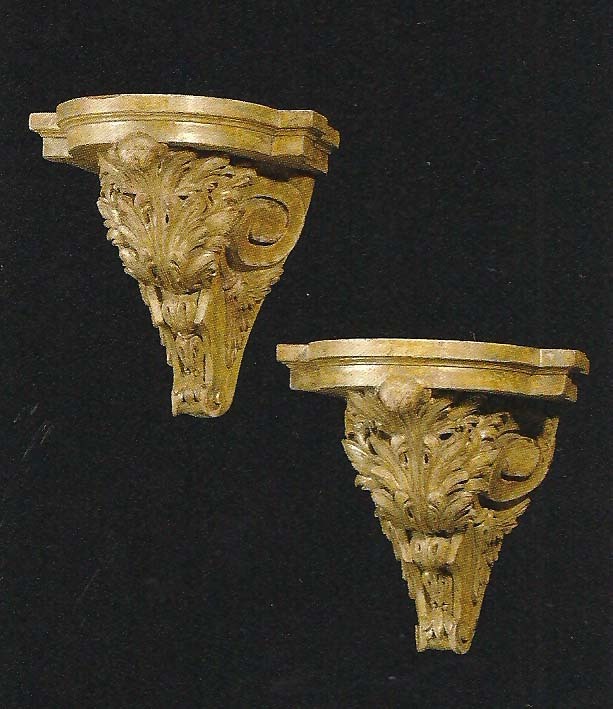 A pair of part-silvered brackets are in the form of a scroll issuing acanthus. $2,400. 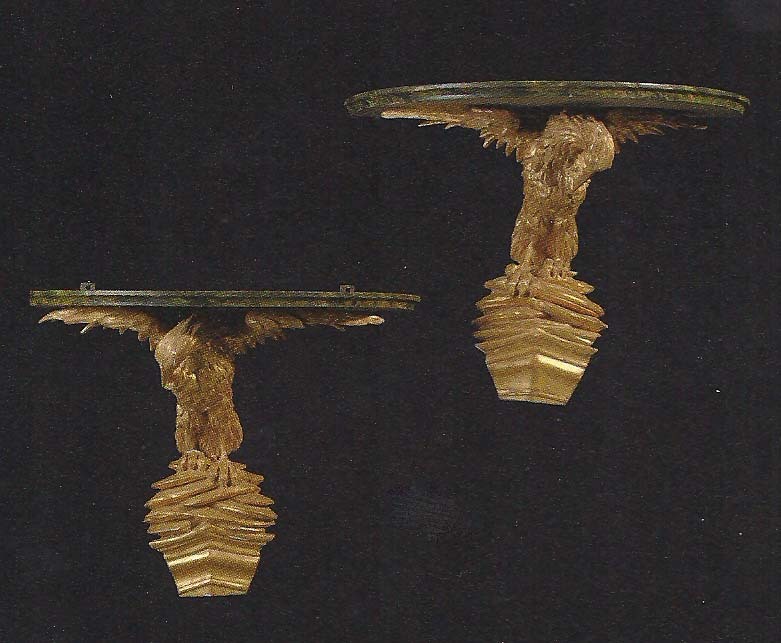 A set of four George III giltwood armchairsare in the manner of Gillow, circa 1775. $20,400. 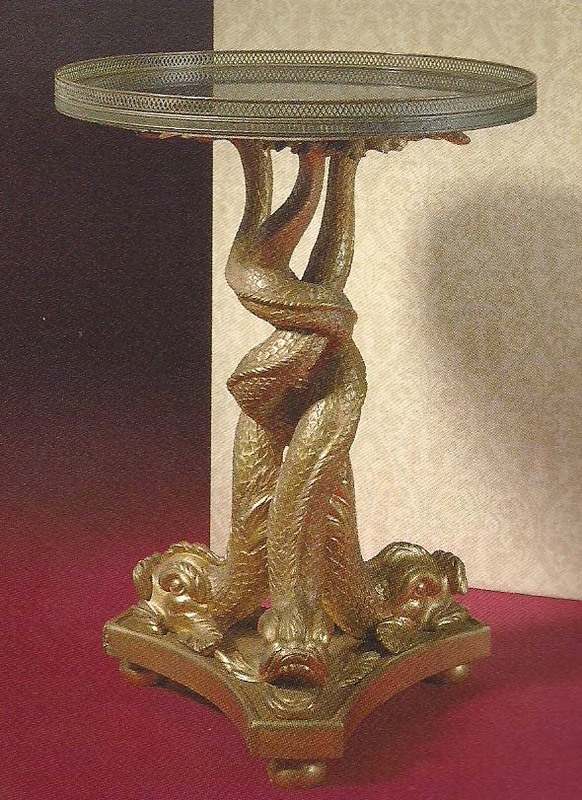 A Regency giltwood center table, second quarter of the 19th century, has an associated French top. $25,250. 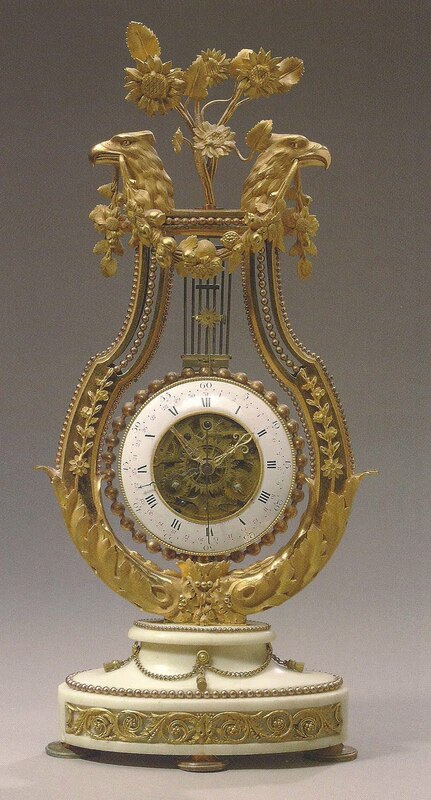 A Louis XV ormolu cartel clock, mid-18th century, has the movement and dial signed Olin a Paris. $19,200. 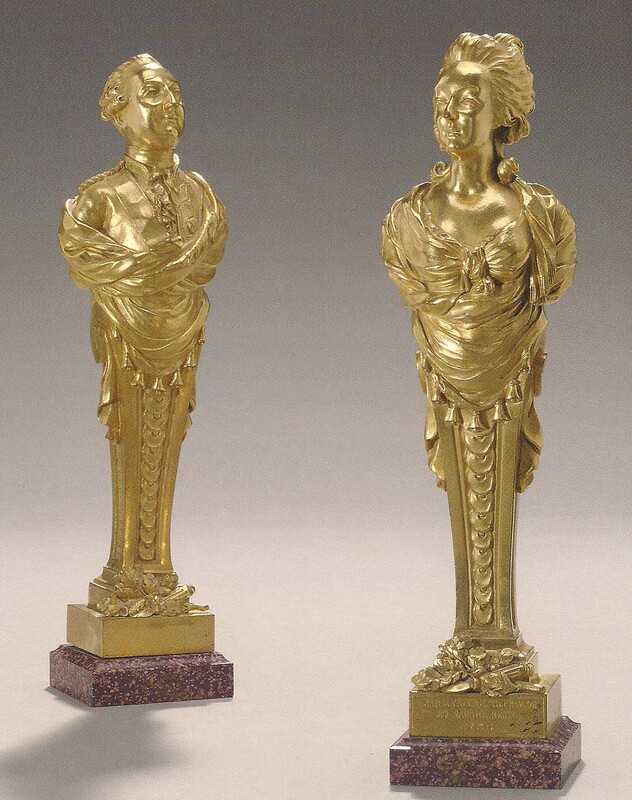 A pair of Louis XVI ormolu and porphyry busts of Marie Antoinette and Louis XVI date from the late 18th century. $14,400. This sale on Friday, March 18, 2005, totalled $4,409,160 including the buyer's premiums. 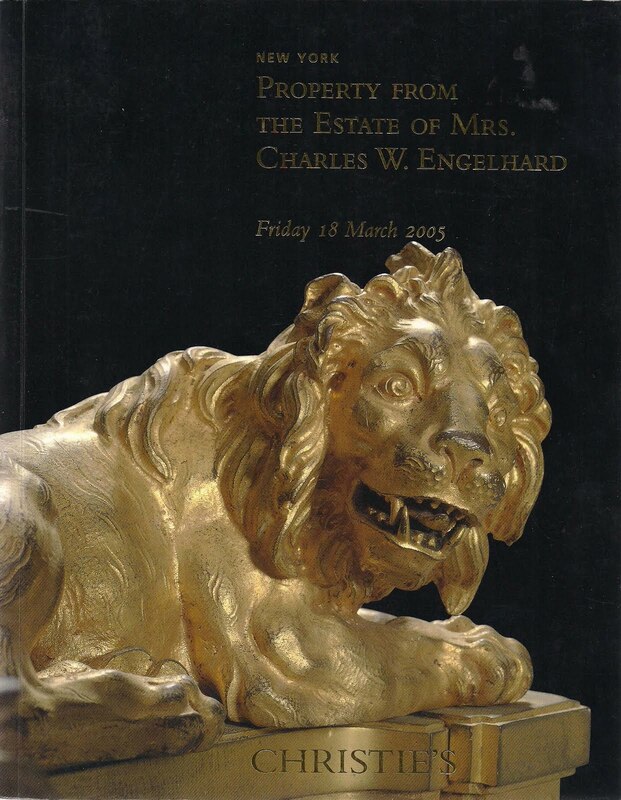 As mentioned in the previous post, items from Mrs. Engelhard's estate was also included in the April 12, 2005, auction "Magnificent Jewels", the March 17, 2005, auction "Old Master Drawings", the March 30, 2005, auction of "Important Chinese Ceramics and Works of Art", and the June 14, 2005, auction of "Fine Printed Books and Manuscripts", all Christie's New York. 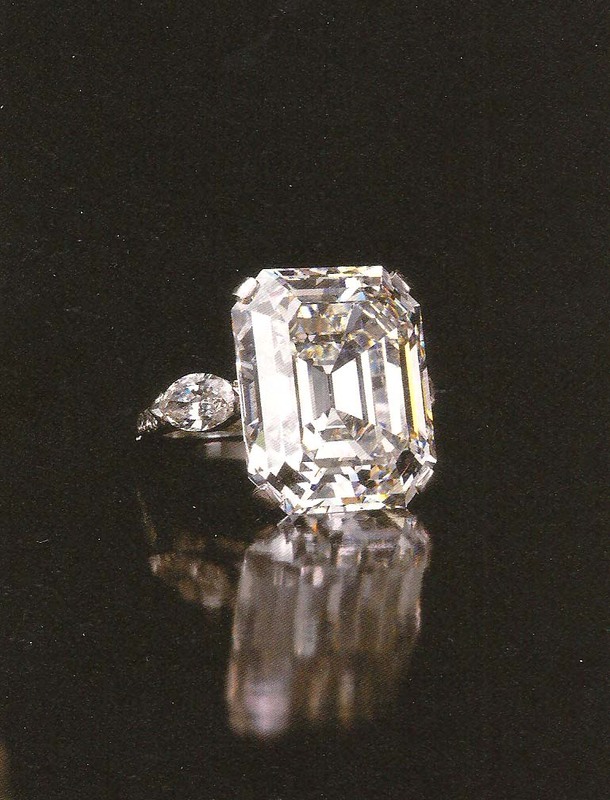 The ring with a 34.15 carat rectangular-cut diamond, flanked by marquise-cut and circular cut diamonds in a platinum setting was designed by Van Cleef and Arpels. $1,080,000. John, this pair of posts is truly outstanding! I am so bored with all the blogs that just show photos, some not even interesting, with no text, captions, or comments! THE DEVOTED CLASSICIST has really developed into a great blog! I look forward to what delightful surprise comes next! Thanks, Shiek. I guess it is from my teaching experience at Parsons and my volunteer work for Decorative Arts Trust that I feel there needs to be more education in design. It is "the more you know, the more you appreciate" philosophy. Your exclamations of praise are greatly appreciated. I always love see any work by Parish-Hadley. You are so lucky to have worked for them. And I couldn't agree more with your sentiment, "the more you know, the more you appreciate. " Lynn, my time at Parish-Hadley was a indeed a great experience. John, it is always such a pleasure to read your blog. It is in my humble opinion the finest design blog "out there". Your intellect and exceptional taste leads me to proclaim this. were so appreciated. Continue on Professor! How nice for me were I to have you as my architect too! This interior was assembled with great taste and no attention to cost, in a manner that is great rarity today. Fabulous! Excellent throughout. Your compliments are most appreciated, Bob. The series on Notable Homes will continue from time to time as I really enjoy taking a closer look at furnishings myself, in addition to the architecture and the owners. Hopefully the landscape setting can be worked in on occasion as well. Reggie, this was just one room in one of their houses, but you get the idea. 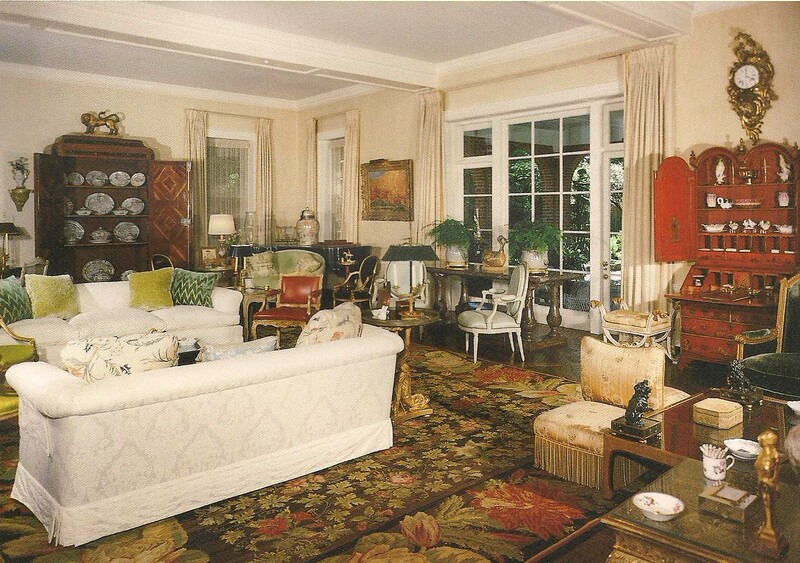 Mrs. de la Renta inherited her mother's great style, however, and runs her homes immpecably too. So enjoyed your post. For a decade I have been with Sallea Antiques and never tire of seeing how beautiful objects of the past enhance interiors! 'voyeuses'. I've never heard of such a chair but am in their thrall and shall go look them up. Bourbon and Pearls, I really enjoy all the specific French terms for various types and forms of furnishings and hope you will too.
' The more you know, the more you appreciate' truer words were never spoken. I was just having this same conversation yesterday with an architect friend about clients and how difficult it is to get some of them to understand that you're not just throwing things around to make money. There's such a lack of visual and arts education and mid century is getting so tired now......Thanks for posting John. Proof again that classic decorating is timeless! Two fabulous posts, John. Love the stories behind the rooms. For one, I did not know they were the owners of Nijinsky and secondly that you had taught at Parsons. Daughter graduated there...best money I ever spent. I remember seeing pictures of Jane E. in all the fashion magazines in the 60's (big hair). She had style across the board. So does her daughter, Annette. Can't get over her bedroom in Ct! Louis, it is a mark of achievement for an interior to hold its own thirty-plus years later, is it not? That is not to say adjustments would not be made over time, but I see Cragwood as a classic. Sometimes I fear that gracious living will become a thing of the past, Julieta. That is one reason I appreciate your blog so much. And, by the way, Mrs. Engelhard's hair was not big in the 80s (when I worked at Parish-Hadley). 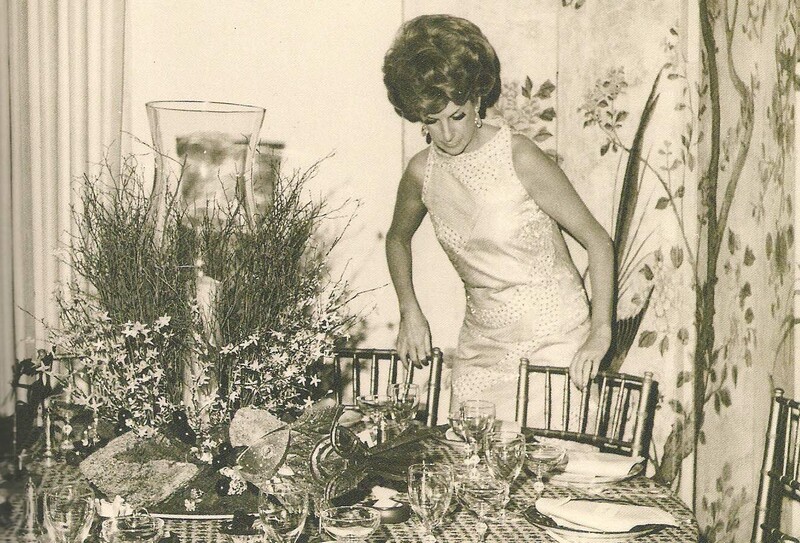 You will be seeing more of Mrs. de la Renta's great style in future posts. Now that Kesi screen is seriously beautiful, and I do like the idea of the drama it would create, both by its Chinoiserie beauty, and by the monumental scale. John, these posts are truly wonderful. Your ability to comment on architecture, interiors, and history is a special gift and an uncommon one at that. I look forward to your future posts, especially this Notable Homes series. Columnist, I am sorry that I did not have detailed photos of the screen. It really is beautiful. Bunny, I really enjoy the decorative arts and it is my pleasure to share with all these appreciative readers. Thanks, Chuck. At some point, we'll compare notes on teaching at Parsons, Paris! Many small businesses close for July (and sometimes August), so be sure to check if there is a list of shops in Paris you want to visit. Today, so many decorators just do not have the expertise to choose good antiques for their projects. Also, they do not want their clients to buy something so expensive and get only a 10% commission when they make as much as 30 -50% off new items. You were fortunate, John, to get such a good education in the design business.